GREEK GARDEN ORGANIC: Honoring the wisdom of a century’s old, local tradition, the Manousakis family nurtured the rare local variety of olives known as Koutsourelia. This variety has proved optimally adaptive to the slopes of Mount Parnonas, making the most of the beneficial winds that cool the olives during the summer and the cold of winter that invigorates the trees. Sensitive to the health and nutritional high standards of consumers, the olives are picked by hand and cold extracted to preserve the beneficial organic substances of the olive oil. The resulting oil is unfiltered, smooth and wonderfully well-balanced. It is the perfect oil for enhancing the flavors of light greens, steamed vegetables, tomato salads, and broiled or grilled white fish. ARIA GREEK: A favorite among the world’s most discerning chefs, this extra virgin olive oil from Western Crete is pressed from estate-grown Koroneiki olives that are pressed within hours of being picked from the tree. 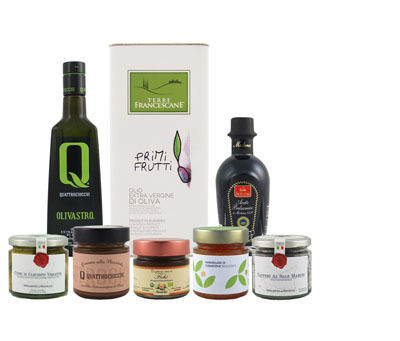 A NASFT winner for “Outstanding Olive Oil”, this exceptional oil is characterized by a unique bouquet and taste that are truly unparalleled. MY OLIVE TREE: My Olive Tree is produced with a sophisticated combination of the traditional and the technologically advanced. The olive trees are from an ancient land and cared for with natural means with respect for the surrounding environment. Olives are handpicked and pressed immediately in the traditional local mill. As a result, the oil is of the highest quality and lowest possible acidity without chemical additives or any kind of further processing involved. A deep emerald green, the oil is rich in aromas of fresh cut grass, artichoke and sweet almond and pairs deliciously with an array of fresh foods from a typical Greek Salad of fresh tomatoes, cucumber and feta, to dressing grilled fish, vegetables and legumes.